The former president was in the hospital for an infection. Former President George H.W. Bush has been released from the hospital and is already making plans for summer travel. Bush's spokesman Jim McGrath tweeted Friday evening the president was released from Methodist Hospital in Houston after being treated for an infection for two weeks. "His doctors report he is doing well and is happy to return home," McGrath tweeted. Bush, 93, was checked into the hospital on April 22, the day after his wife Barbara Bush's funeral. Bush woke up the morning after the funeral with a urinal tract infection, which turned into septic shock, Bush's son, Neil Bush, told Houston ABC station KTRK. (Susan Walsh/AP) In this Sept. 2, 2008 file photo, former U.S. President George H.W. Bush, left, and former first lady Barbara Bush are seen at the Republican National Convention in St. Paul, Minn.
"Doctors said he'd be in the intensive care unit for a week or whatever," Neil Bush told KTRK last week. "He came back in two days. Who knows when he's going to come home, but he's doing much, much better." The former president is already making plans to travel to Maine, where he has spent his summers annually for decades. McGrath told ABC News the ex-president's advance team leaves for Kennebunkport, Maine, this week to prep their home with the medical support he will need for the summer there. He will likely arrive the week of May 22 and stay in Maine until after Labor Day. Bush plans to be back in Houston if the Astros make the MLB playoffs and for the start of football season, McGrath told ABC News. Barbara Bush died on April 17 at 92 years old after she left the hospital and decided to forgo further medical treatments for her failing health. 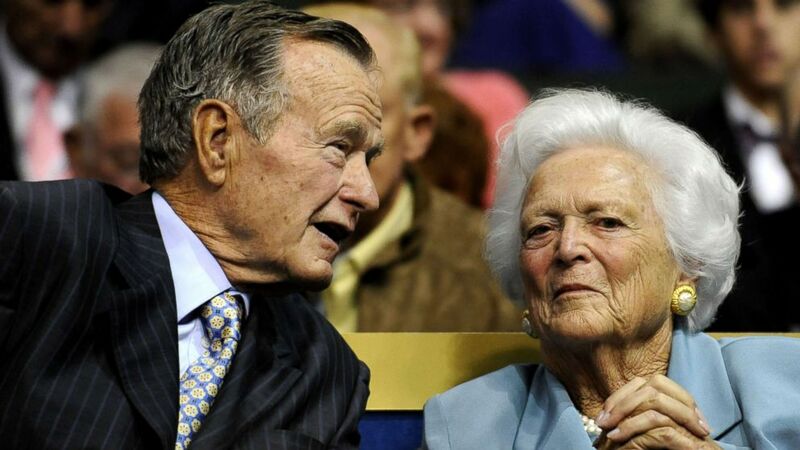 The two had been married for 73 years -- the longest marriage for any president. "He held her hand all day today and was at her side when she left this good earth," said Jean Becker, chief of staff at the former president's office.